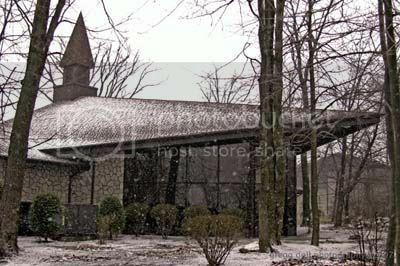 This is the J. Irving Wholley Memorial Chapel on the campus of the University of Pittsburgh, Johnstown (PA). I was going to shoot several pictures around the campus but it was snowing to beat the band. I'll go back when it gets nicer. 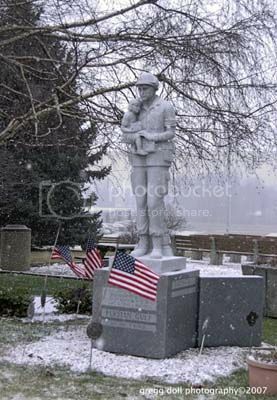 First erected as a Vietnam Vets Memorial, this stands in the East Hills section of Richland Township. Today it bears the names of all service personnel from the township who lost their lives serving their country since Vietnam. The memorial is the work of the East Hills Kiwanis Club. 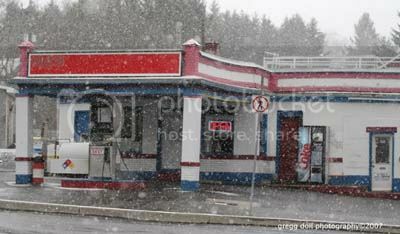 Probably the oldest gas station in Ebensburg and the last of its style in the area. Looking west into Ebensburg, PA. The large building in the picture is the back of the Court House and County offices. 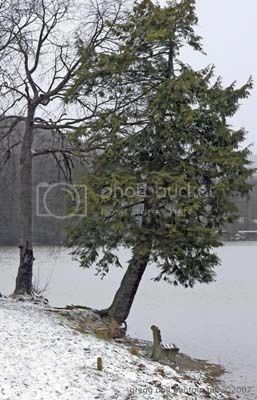 Lake Rowena, a community park and lake on the east side of Ebensburg. Right now there are few if any fish in the lake. It was recently drained to get rid of grasses that were taking over, and is now filling up again. 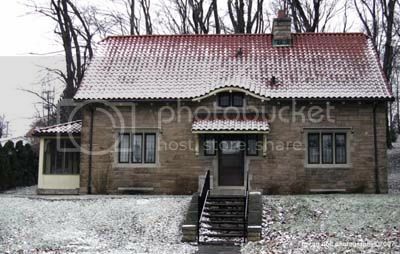 Now called Sacred Heart Cottage, this is one of 3 gate houses on the former Charles Schwab Estate in Loretto, PA. 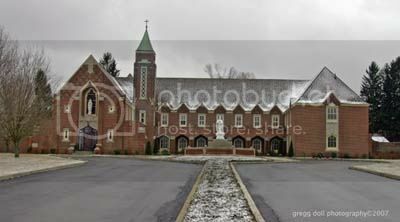 The monastery of the Discalced Carmelite Nuns in Loretto, PA. This building was erected by Charles Schwab in 1930 to honor his sister who was a member of the order. 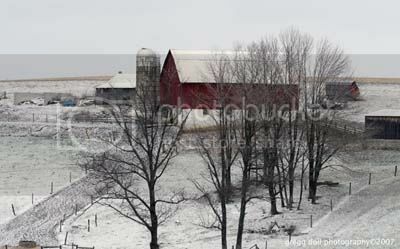 Just a barn along the road outside of Loretto Borough. 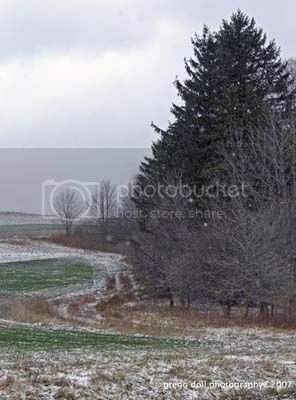 Note to self: Never again pull off to the side of a farm road to take a picture in the snow. Under the snow is mud...Idiot! 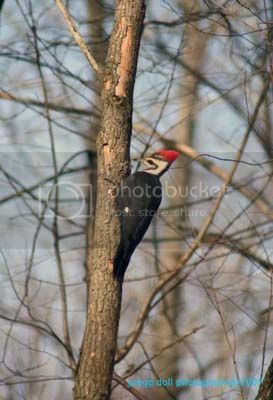 Shown in the next two photographs is a male Pileated Woodpecker. At 16 to 19 inches long it is the largest of Pennsylvania's woodpeckers, in fact it is one of the largest in North America. You can tell the male from the female by the red in the male's mustache stripe at the back of his bill. Shot at f 5.6, 1/400, ISO 300, at 300 mm. The Pileated Woodpecker has a wing span of 26 to 30 inches. 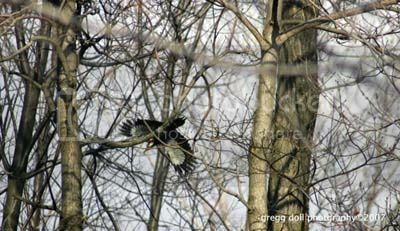 This is the first time I've ever shot a Pileated Woodpecker flying. These are very wary birds and very hard to see. I only have these pictures because I was shooting from my work room window. f 5/6, 1/1250, ISO200, at 300 mm. 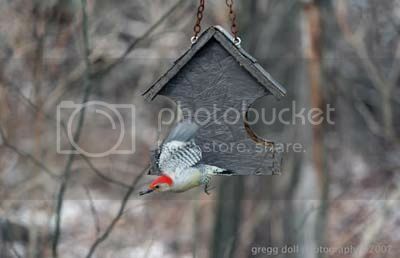 Another first this week is a shot of the flying Red-Bellied Woodpecker. It only visits this feeder and the suet feeder. F 2.8, 1/1250, ISO800, at 130 mm. 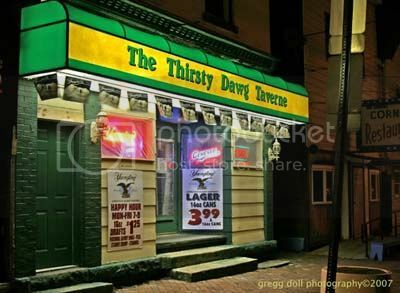 The Thirsty Dawg Taverne, Patton, PA. A night shot. f 14, 1 sec ISO200, at 28 mm. Great shots of the woodpeckers. I like woodpeckers and know they are very shy. I especially liked the one where it was flying. Never realized the white would show on the wings like that. Good work.